Broadband Extender Flex 500 Kit offers high performance Homeplug powerline adaptors designed to increase the range of your broadband in the home. BT's Broadband Extender Flex 500 Kit has been designed to work with any service provider to make sure everyone can make the most of their Broadband at home. BT’s Broadband Extender Flex 500 Kit is so easy to use, All you need to do is plug one unit into your wall socket and connect it to your router, and the other into your wall socket wherever you need it in the house, and connect it to your devices with an ethernet cable, and you are ready to enjoy a complete broadband experience. You also won’t lose a socket with the pass through socket included! 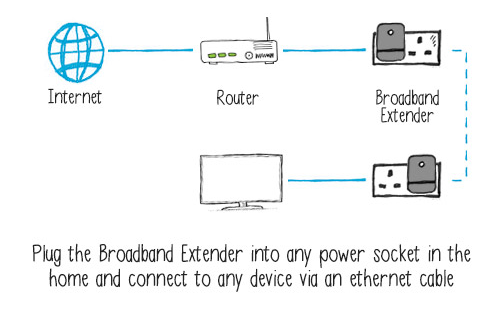 With BT’s Broadband Extender Flex 500 Kit, you can freely move the additional plug around the home to suit your needs, simply plug it into the wall and connect up a wired device to enable internet, you are able to connect any wired device wherever and whenever you like. BT's Broadband Extender Flex 500 Kit can support all your online needs with up to 500 Mbps for smooth HD/3D streaming, online gaming or faster downloads. BT's Broadband Extender Flex 500 Kit will help you solve a variety of broadband problems you might have around your home. Connecting up a PC for an online gaming experience or Smart TV, freeview boxes and laptops that don't have Wi-Fi capability. BT's Broadband Extender Flex 500 Kit will help you alleviate these problems and make the most out of your broadband at home. BT's Broadband Extender Flex 500 Kit is compatible with other BT Extender products, you can purchase more kits and link them up together to create a larger network in your home. It is also compatible with a few other AV HomePlug powerlines so you can add them to an existing network in your home. The Broadband Extender Flex 500 Kit utilizes HomePlug AV500 Powerline technology, however this can still be integrated with AV200 technology in your home.